As Obama and the US drug czar roll out their 2013 plan, here’s a look at what’s in it, and what they’ve done so far. 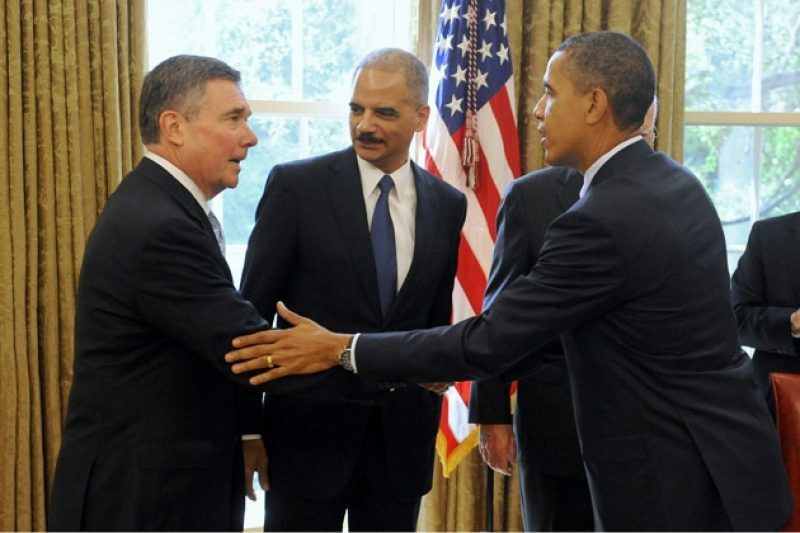 When the Obama administration released its 2013 Drug Control Strategy recently, drug czar Gil Kerlikowske called it a “21st century” approach to drug policy. “It should be a public health issue, not just a criminal justice issue,” he said. But a government report released a day after the latest proposal questioned the office’s impact so far. “As of March 2013, GAO’s analysis showed that of the five goals for which primary data on results are available, one shows progress and four show no progress,” the report by the Government Accountability Office found. For instance, the GAO noted that there’s actually been an increase in HIV transmissions among drug users and drug-related deaths, as well as no difference in the prevalence of drug use among teens. As the administration lays out its latest plan on a new approach to drugs, here’s look at what’s in it, and what they’ve done so far. But overall, the government spends roughly the same proportion of the drug policy budget on law enforcement now as was spent during Bush’s final years in office. In Obama’s 2014 budget proposal, 38 percent is allocated for domestic drug law enforcement, while another 20 percent would be spent to crack down on drugs along U.S. borders and abroad. The Obama administration has also renewed funding for controversial programs like the Justice Assistance Grant program, formerly known as Byrne Grants, which had been cut under President Bush. The funding created local drug task forces, which critics say were quota-driven and increased corruption and misconduct. Budget-minded conservatives like the Heritage Foundation also argued the grants hadn’t led to a decrease in crime. States like California and New York have used some funding from the program for treatment instead of enforcement. According to the Bureau of Justice Statistics, the number of inmates in state prisons dropped roughly two percent from 2010 to 2011. Seventy percent of that is from a decrease in California’s prison population, after the Supreme Court upheld an order for the state to reduce overcrowding. A 2011 GAO report found statistics suggest drug courts reduce recidivism, but there’s not enough data to fully assess their effectiveness. Despite that, only 1 in 10 of the 21.6 million Americans in need of drug or alcohol addiction treatment received it in 2011. The number of people receiving treatment has stayed roughly the same since 2002. The treatment gap should narrow as Obamacare goes into effect: Roughly five million more Americans currently facing drug addictions will soon have insurance coverage for treatment. “That’s the biggest expansion of treatment in 40 years, and maybe in the history of the U.S., ” said public health professor Keith Humphreys, who has served as a policy advisor to the ONDCP. ONDCP spokesperson Rafael Lematire said the administration’s latest plan calls for an increase in the number of health care workers to treat newly insured patients. The latest drug strategy highlights the need to reduce “collateral consequences” (barriers to public benefits, employment and other opportunities) for those convicted of drug crimes. But Obama has little leverage on those issues, which are mostly decided on the state and local levels. For example, while HUD has encouraged public housing authorities to not disqualify former drug offenders from receiving public housing or Section 8 vouchers, it’s up to each city housing authority to determine their own rules. “While we encourage housing authorities to give ex-offenders a second chance, the decision to admit or deny to public housing remains with the housing authorities,” said HUD spokeswoman Donna White. Obama’s administration has not announced any plans to address the 1996 federal ban on food stamps or cash assistance for those convicted of drug felonies. Most states have opted out of or amended the law. In 2011, the government released a plan to crack down on the abuse of prescription drugs. There’s little current data on overdose deaths, but recent studies have indeed noted a drop in prescription drug abuse. Advocates have praised Obama's decision to endorse increasing access to emergency drug Naloxone, which can reverse opioid overdoses. Some lawmakers have criticized that position, saying it essentially encourages drug abuse. The GAO report notes that the prevalence of drug use among teens and young adults has stayed the same since 2009. “With the exception of marijuana use, illicit drug use is trending down, specially prescription drug abuse and use of cocaine, hallucinogens, inhalants, and methamphetamine,” said ONDCP spokesperson Lemaitre. Research cited in the GAO report suggests the increase in marijuana use is tied to a decreased perception of risk. Obama remains staunchly opposed to legalization, but it’s unclear how hard the administration plans to come down on states loosening marijuana laws. Obama has overseen far more medical marijuana raids than under the Bush administration. For states that have legalized pot, Attorney General Eric Holder said he intends to “enforce federal law”, though Obama said he had “bigger fish to fry.” The Department of Justice said it is still reviewing the latest laws.